When it comes to embracing a community, some indies may, "talk the talk," but not really "walk the walk," (although, most do a wonderful job of walking the walk). 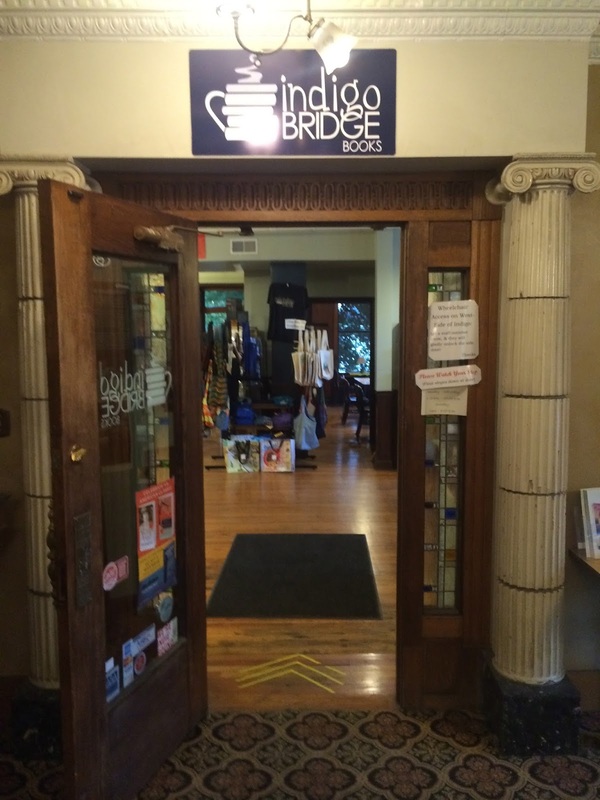 Indigo Bridge Books & Cafe embraces its community all the way from its store name to its actions, including aid to non-profits and social causes. The folks at Indigo Bridge wanted the name of the store to be something that symbolized one of their biggest hopes for the store; building community. Community that reaches past the divisions of neighborhoods, social classes, political ambitions, religious beliefs, ethnicities, national borders, even languages. Thus, a bridge. And, well, indigo is a really cool color. Indigo Bridge tries to live by this standard in all that it does. It is active with store events which feature people of diverse backgrounds. It offers a weekly bi-lingual story time of English/Spanish. They are considering expanding this program to include additional languages. This store is very strong for children's books and programs. In addition to the bi-lingual story time, there is also a twice weekly English language story time. There is a cafe located inside the bookstore and its offerings are all from local sources. 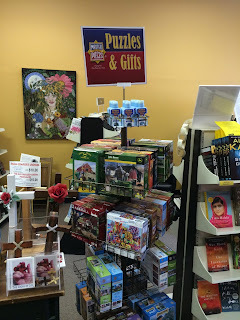 The store is arranged on a split-level and offers all new books. 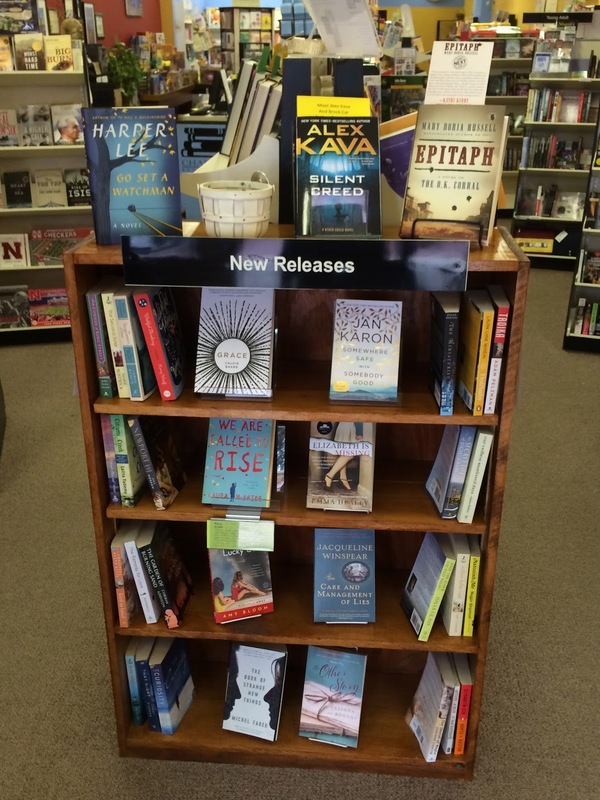 The staffers all have their genres of interest and you can find their recommendations around the store. I had a great talk with Vernée H., the events coordinator, and she told me that all of the books in the store are hand selected by the staff. This is so helpful to customers when they're browsing books and want to talk to one of the booksellers. 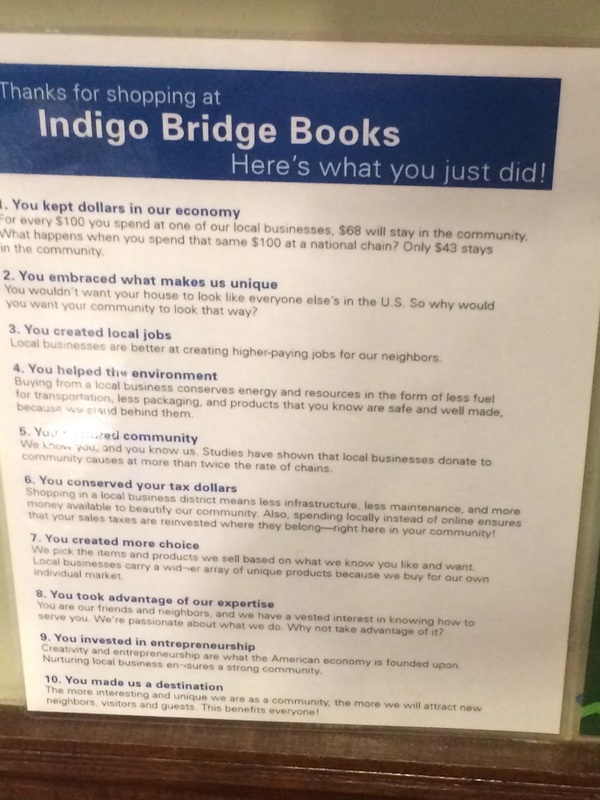 Indigo Bridge is also involved with many schools, a great way for indies to integrate in the community. 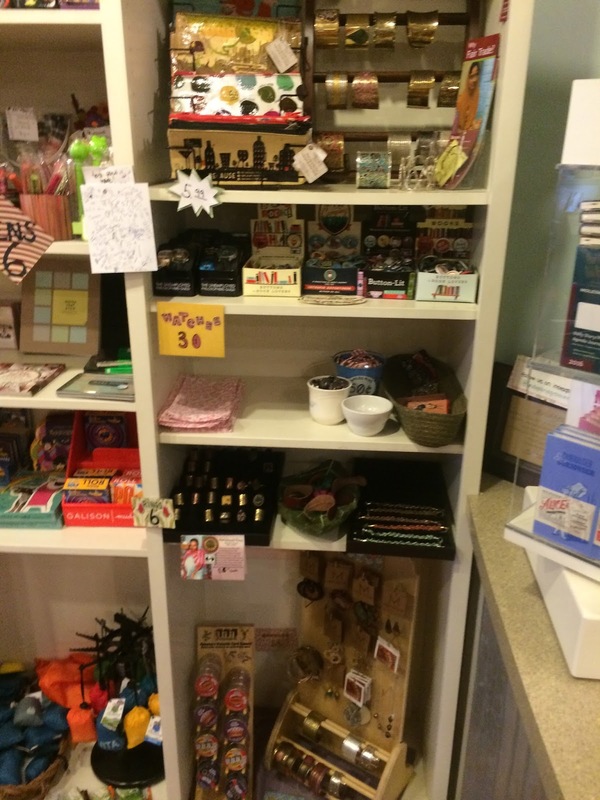 This indie is located in a historic building in the Haymarket District of Lincoln. When you're done at Indigo Bridge you'll want to explore the rest of the Creamery Building its located in and the other businesses as well as the many unique shops and restaurants nearby. While in the store though, you're going to enjoy a fine selection of new books and sidelines. My visit was made all the better by the wonderful people I met and my time spent talking to them. Vernée, Alison, and Cass were terrific to patiently take time to talk to me and share with me much about the store. 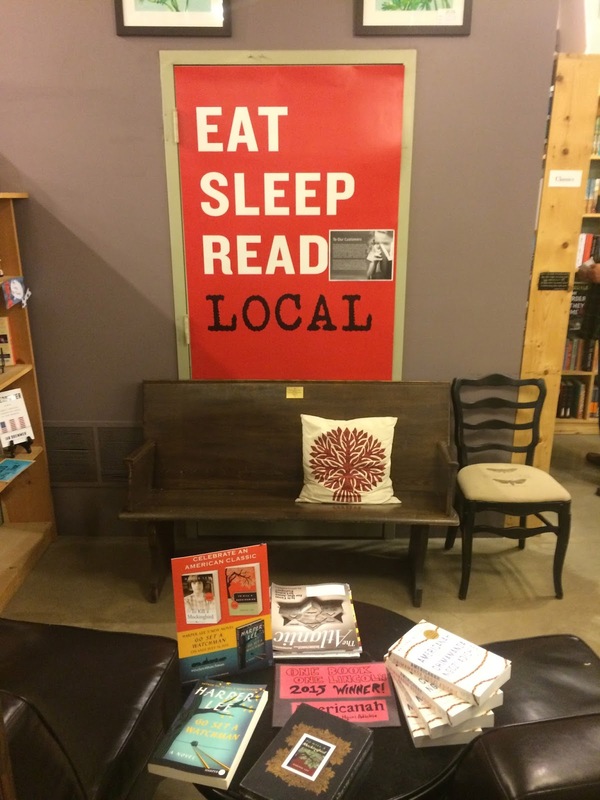 The future of independent bookstores may include a non-profit component and some already do. Thanks to Indigo Bridge, we're being given a vision on how to do it. 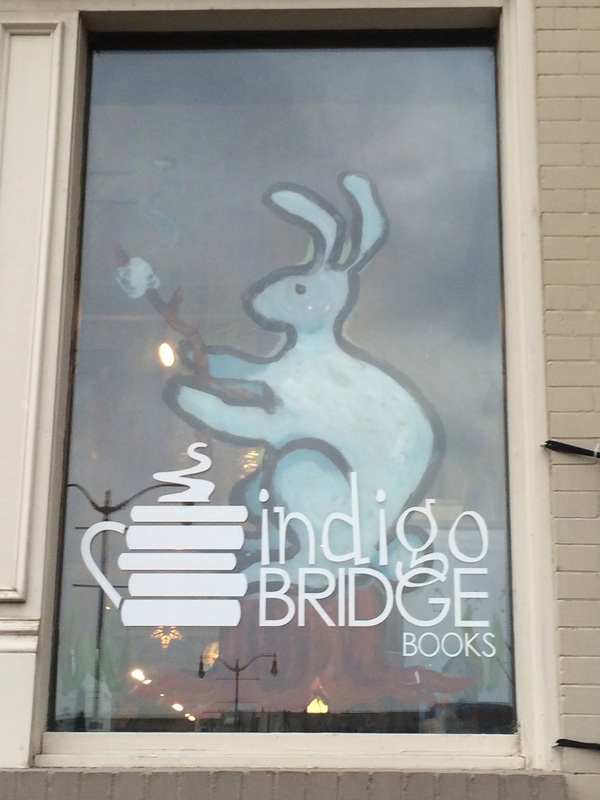 Kudos to Indigo Bridge for their dedication to education and children's literary. 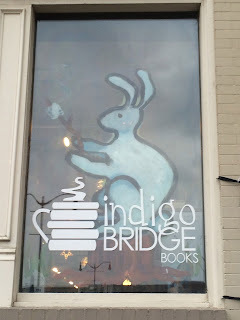 And kudos to the people at Indigo Bridge for providing a great bookstore experience. Now we know there's more to Lincoln than Big Red. Go to an indie and buy a book. Bonsoir. JUST FINISHED: In The Heart Of The Sea, Nathaniel Philbrick. True story of the Essex whaling ship, its sinking, and the survival at sea of the crew in 1820. Outstanding and highly recommended. I loved this book. Read it before the movie comes out. CURRENTLY READING: Just Mercy, Bryan Stevenson. I can already tell you before I finish this book that it is outstanding. Indigo Bridge Books & Cafe is located in the Creamery Building. This is just inside the entrance into the building. 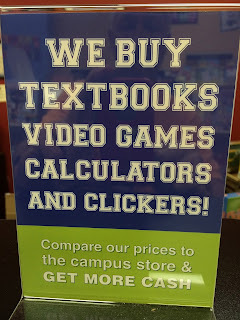 Turn right and you're in the bookstore! View looking into the store, you can see the cafe towards the left. The length of the store is to the left after entering. On a budget? Here's your section close to the entrance. They even have a piano here which would make Cheryl M., The Indie Bob Spot graphic artist and logistics manager, happy. Just a portion of the local artists and interests. A nice picture of the cafe. This is a very cozy seating area where you can browse a book. A nice selection of greeting cards, an important part of the sidelines here. Check out the purple book. Wimpy Kid in Spanish! I love it! Support your local indie for lots of reasons. This room is available for small meetings and book clubs. Very nice. Some of the kids might want to hang out here. View looking back through the store toward the front entrance. The cafe would be way up there on the left. Surprise books. I think this is a great idea! 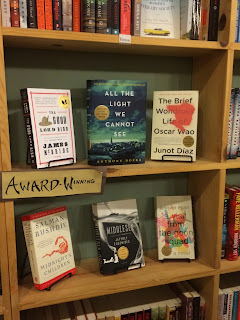 Great display of award winning books. With Vernée, the events coordinator at Indigo Bridge. Thanks for a great visit. Same picture using the panoramic function on the camera with a nice view of the store. 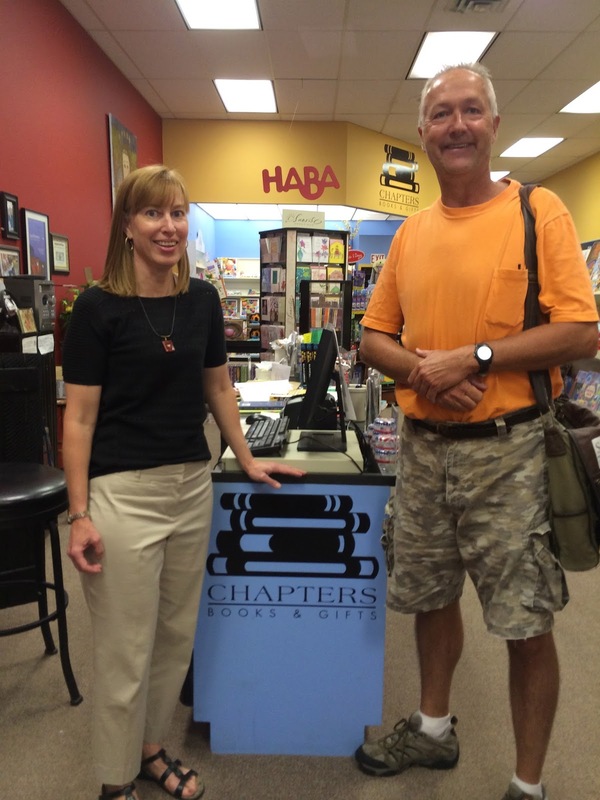 If you live in a small town and don't have a bookstore, I would encourage you to contact Carla K., the owner of Chapters Books & Gifts in Seward, NE. 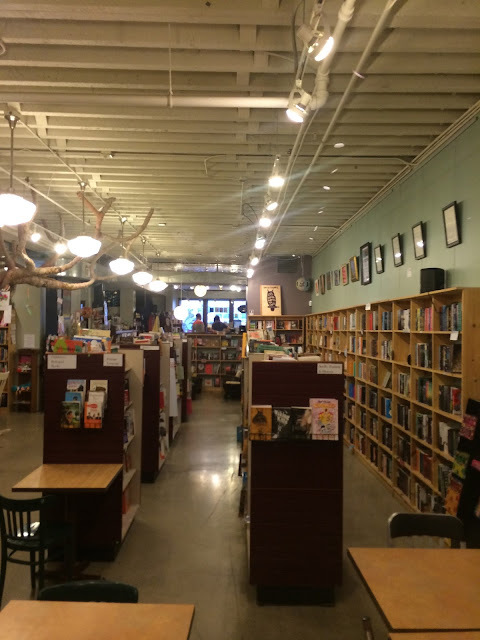 This independent bookstore is celebrating 11 years of business this month in a small midwestern town of approximately 7000. As with all indies located in towns similarly sized, I always ask how. The answers at Chapters Books & Gifts all seem logical to me. 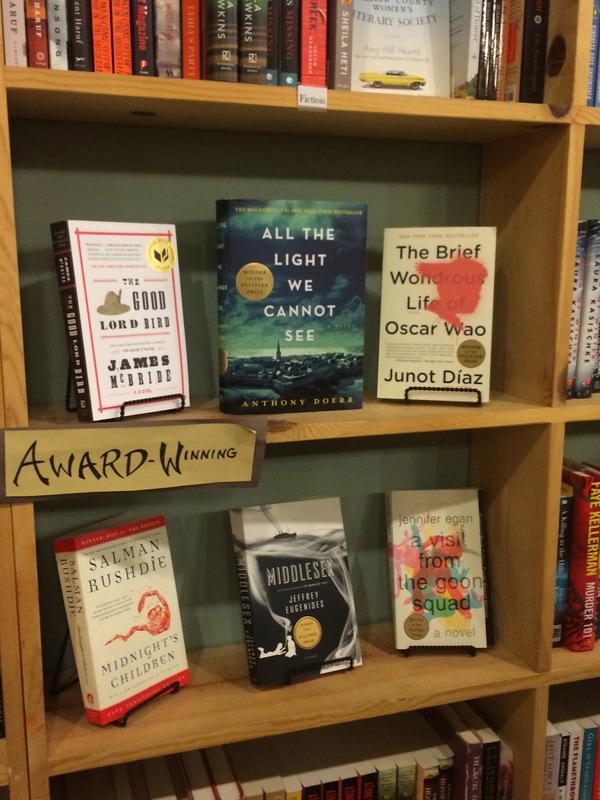 A bookstore can receive no better endorsement than the ones that come from their customers. While I was visiting and asked Carla the "how" question, a nice lady customer who overheard me didn't hesitate to answer. She said it's because Carla is friendly, she's nice, and she really knows her books, especially for young adults and children. I responded that this is the perfect description of all the successful owners and booksellers I meet along my journey. And from my brief visit here I couldn't agree more. This one-level store is neat and well-organized. It is particularly strong for young adult literature and children's books, which is compatible with Carla's background. 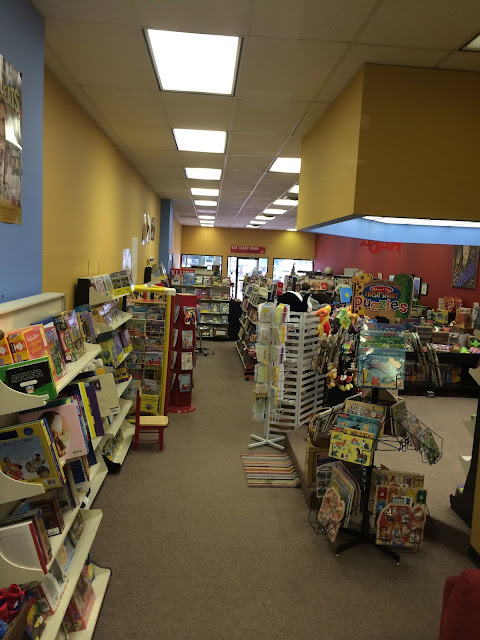 Another component of success here is deep community involvement including a partnership with the many area schools as well as author events in-store and off-site. Later in the week Carla was partnering with a local winery for an off-site author event. Whenever an indie can do this I think it is great. These events and the sidelines are an integral part of the business here. Children will love this place as many of the sidelines are geared towards them. That, along with the terrific children's section, will really attract the kids. Carla is also working to increase the store's involvement with the local college, Concordia, and hopeful of bringing more business from that segment of the community. Even cat lovers will love Jane! entering (note to self: consider keeping dog treats in my book travel bag). A friendly dog, a friendly owner, a store full of books, and kid friendly. And the whole time great music from NPR playing in the background. What more could a book customer want? If you're one of the few in Seward who hasn't been here yet, get with it. You'll love your visit to this gem on the square in Seward. Go to an indie and buy a book. Bonsoir. JUST FINISHED: Blackout, Sarah Hepola. Memoir of the author's severe alcohol addiction which wiped unfortunate events from her memory after too much to drink. Excellent and highly recommended. CURRENTLY READING: In The Heart Of The Sea, Nathaniel Philbrick. RECENTLY PURCHASED: Breaking Creed, Alex Kava. Unharmonious, Laine Boyd. 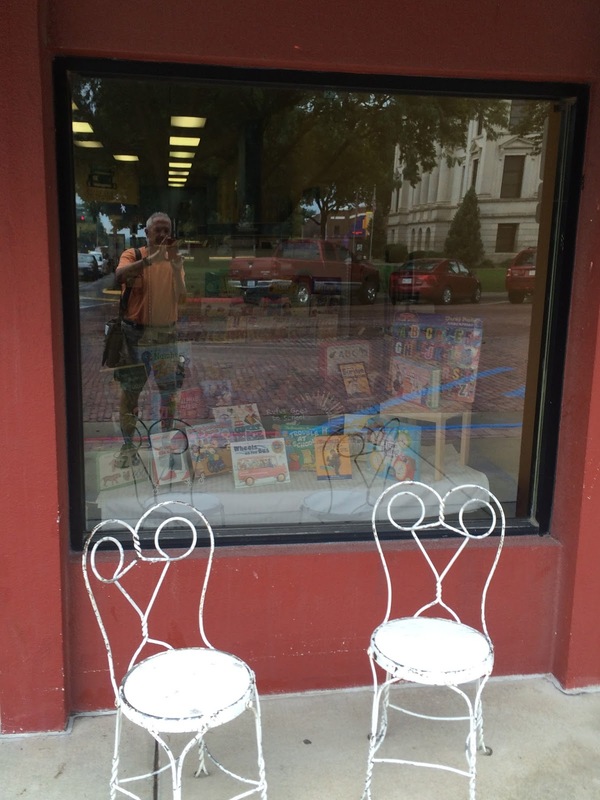 Front window display and a nice place to sit with your book. Nice display of recent releases. On a budget? Select a free book! More sidelines, many geared toward kids. Ok, I think I could sit here quite comfortably with Jane and a book! 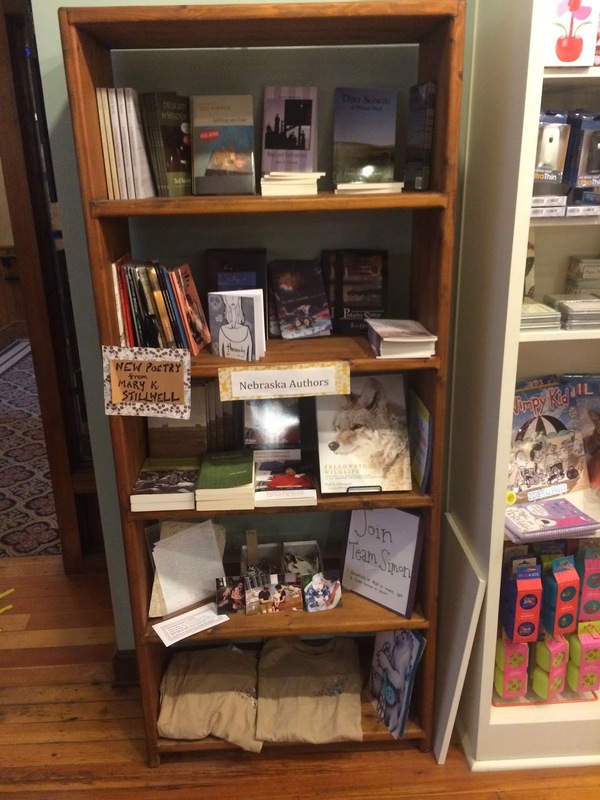 One more reason for everyone in the Seward area to shop at this bookstore. 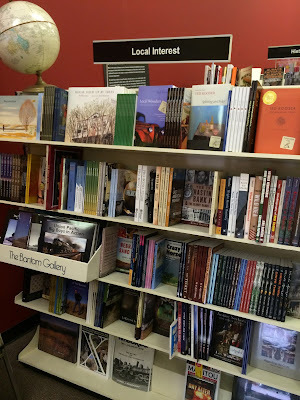 A nice section of local interests and authors. If you're in Nebraska and aren't a Husker fan, you certainly know someone who is. Here are your gift ideas for that person. Beyond this door, you can see the Seward town square. One more reason to visit this indie. With Carla, the fine owner at Chapters Books & Gifts. Thanks for a great visit. Independent Bookstores are my happy places. I go, I visit, I browse, I'm happy. The folks in Half Moon Bay, CA are losing a happy place. As you read this, Bay Books is now closed after a long successful run. I visited here on a Monday and the store was closing on Wednesday. I barely made it in time, but I got to visit while the store was in its final breaths. There were many dear friends coming to pay their respects in these, the final hours of Bay Books. Bay Books, 37, passed away after a brief illness on July 15, 2015. It was surrounded by many long-time friends as well as Jeff B., manager, and Jamilla, C., a bookseller, both faithful until the end. For many years, it was a healthy, vibrant independent bookstore, featuring frequent author events. It was the only indie I've met that had a walk-in humidor with a wide variety of cigars. Where will I ever find another bookstore with that combination? The end came suddenly for Bay Books. It was announced one week prior that the lease would not be renewed. It is not known what will become of unsold inventory or what will become of the Bay Books corpse. Survivors include the many fine indies scattered around the country. In lieu of flowers, please consider purchasing a book at your favorite indie. Condolences poured in from customers during my entire visit. "I used to bring my grandkids here and now they're in college." "We're in mourning." "I just joined your book club a month ago and now you're closing." (I overheard these exact quotes from customers in the store). And I'm sure this is just the tip of the iceberg. This store DID have great local support from everything I could see. I don't know the business circumstances that forced Bay Books to close but I don't think lack of local support was one of them. On the sad day of my visit, I had a great talk with Jeff and Jamilla. The store was very busy on this Monday morning and prices were reduced on everything. Jeff didn't know the reason or the whys, and this announcement caught them off-guard. I don't know what these two terrific people will do but I think they'll land on their feet. The Bay Area has a lot of indies and any of them would be lucky to have their talent on staff. Readers, go to your local indie before it is too late because Bay Books is an example of you never know what will happen, just like life. 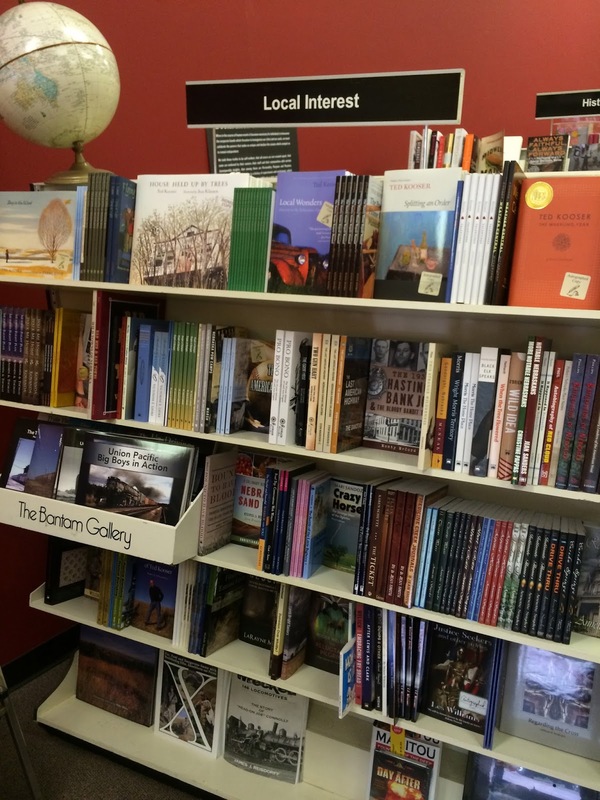 Go to an indie and buy a book in their memory. Bonsoir. JUST FINISHED: We Are Called To Rise, Laura McBride. Fantastic story told by four different characters whose stories finally merge in a most heartbreaking way. I'll be watching for more from this author. Highly recommended. CURRENTLY READING: Blackout, Sarah Hepola. RECENTLY PURCHASED: H Is For Hawk, Helen Macdonald. 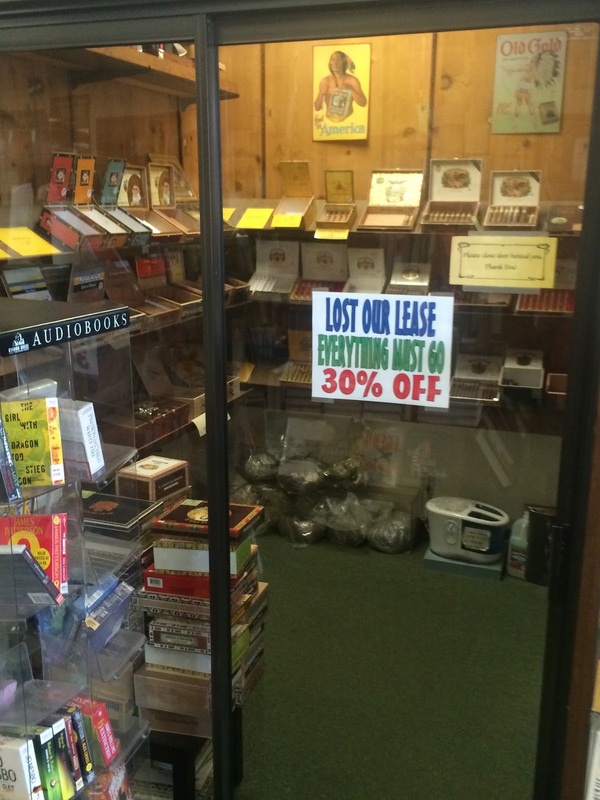 The only indie I've visited with a walk-in humidor. If I were a cigar smoker, I would've been all over this. Cigars and books! One of the fiction displays. View from the rear of the store looking toward the front entrance. Poster-sized book covers were around the store. Wait a minute. 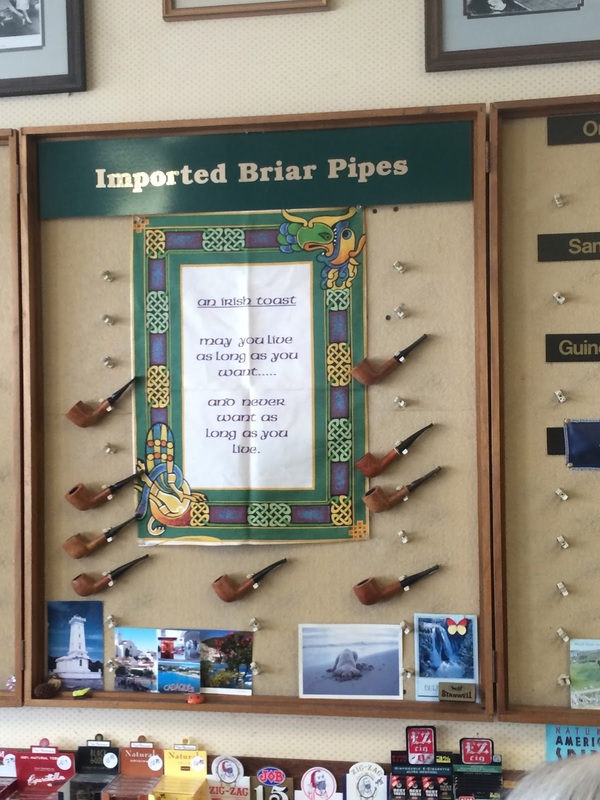 Cigars, books, AND pipes??!! Forced smiles on a sad day. Jamilla on the left and Jeff in the middle. Thanks for a great visit.